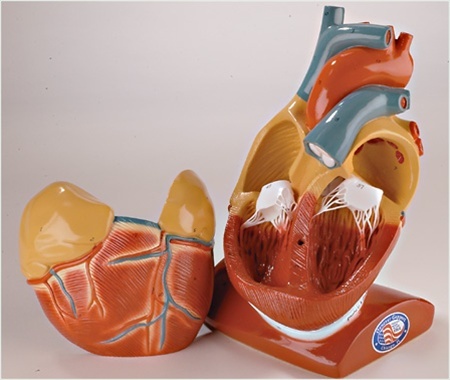 Its large size making it ideal for group study, this heart separates into two parts, making it easy to trace blood flow through the chambers, valves and vessels. 59 features are number coded and identified in an accompanying key including: the coronary arteries, circumflex artery, coronary veins and coronary sinus, segments of the esophagus and trachea, lower portion of the pericardium, diaphragm section, flexible tricuspid valve, pulmonary valve, mitral valve and aortic valve. Overall dimensions: 7x5x10 inches (17x13x25cm). Autographed Anatomy Models: The only models in the world which are personally autographed and dated by their handcrafter! 100% American-made, every step in the production of every Autographed Anatomy model molding, hand sanding, hand painting, number-coding, labeling and autographing is carried out here in our DGi Skokie factory. Quality is unsurpassed. Delivery is from stock. And should you ever have the need, replacement parts, repairs and refurbishing of your Autographed Anatomy model are just toll-free phone call away.